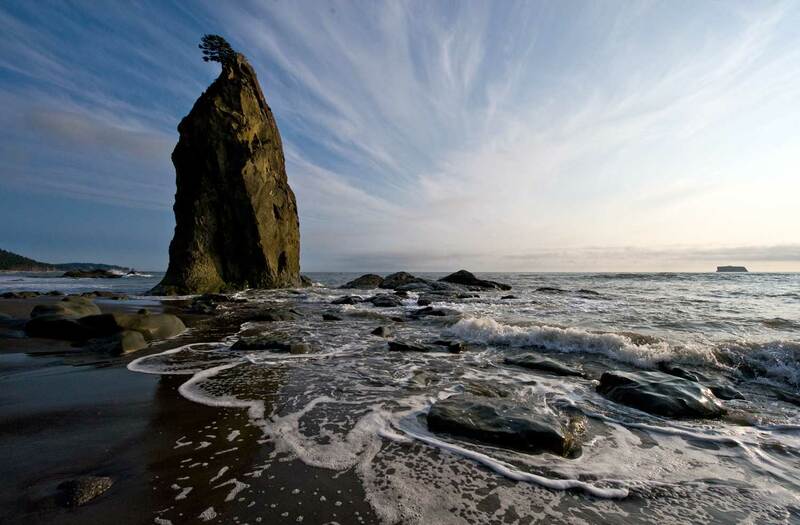 For the past 40 odd years, we’ve been visiting the coast of the Olympic Peninsula, staying alternately at Mora campgrounds, Three Rivers, and LaPush Ocean Park, with occasional sojourns along the shore – beach hikes of 2-5 days duration. I’d posit that nature and our connection to it is a work of imagination; never static, changing ever as we change. Here, for general enjoyment, are two shots of the same scene on the same day, but quite different, I think. One I prefer in color, the other black and white. Two miles north on Rialto Beach, itself just north of LaPush. A stone’s throw from Hole-in-the-Wall, for those familiar with the area. Same, with James Island on the horizon, left. 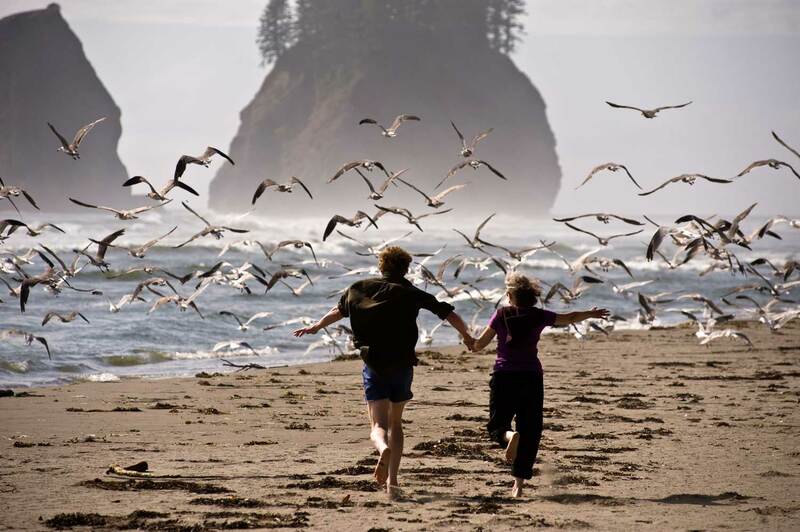 And further south, my brother Kael and sister-in-law Anne frightened great flocks of gulls on 2nd Beach, where we’ve been jumping waves in the 46 degree water since we were small. This last trip was especially sweet if only because the forecast was consistently so bleak. Clouds and showers were predicted for both days represented above, and we were prepared with parkas and tarps. It reminded me of an old and now-departed friend adherence to what he called The Doctrine of Zero Expectations: expect little or nothing and you’ll never be disappointed; you may even be pleasantly surprised. 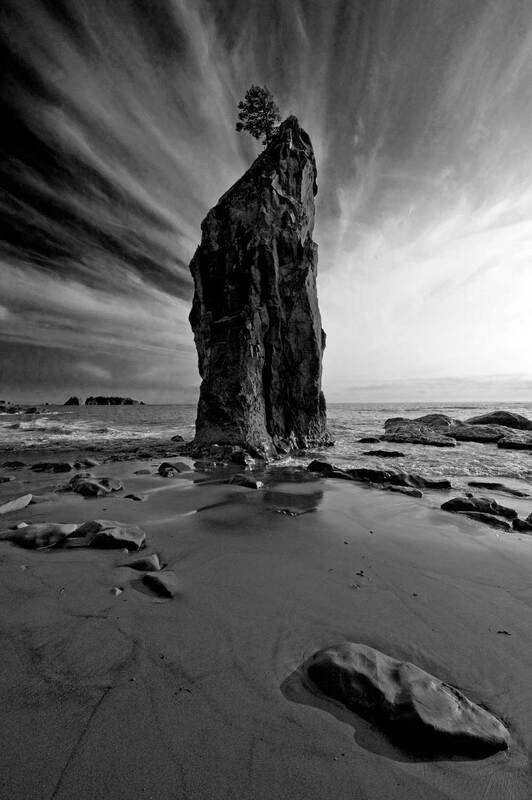 Your BW image of the sea stack at is just breathtaking. Thanks for seeing it, and making such a stunning reproduction.